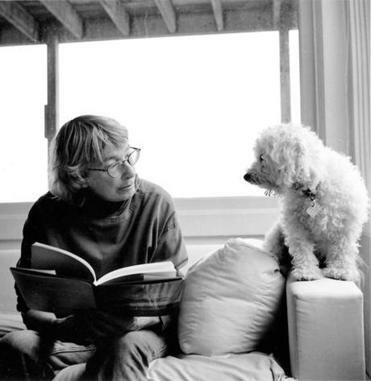 Most mornings find poet Mary Oliver wandering through the woods near Provincetown, but on a recent one she was drinking coffee in bed in a Boston hotel. Oliver, winner of both the Pulitzer and the National Book Award, was in town for back-to-back, sold-out readings at the Museum of Fine Arts. OLIVER: “Good-Bye to All That” by Robert Graves, which I like very much. I had forgotten about the desolation of World War I. I’m also reading “India” by Diane Eck, who teaches at Harvard University. It’s about the sacred places that still exist in India. I went to India and was quite taken with it. There’s a feeling there that things are holy first and useful second. And in this country, we have it backwards. I’m a little crabby this morning. BOOKS: Anything else you are reading? OLIVER: I read Rumi, the 13th-century Persian poet, every day. BOOKS: How long have you done that? BOOKS: Have your tastes in reading changed over time? OLIVER: Not very much. The challenge is to keep up with all the new poets at the same time I love the old ones. I’ve recently been reading David Keplinger and Frank Gaspar. I still spend a lot of time with James Wright, Robert Bly, and Galway Kinnell. BOOKS: Who are the old poets you return to the most? OLIVER: Walt Whitman, Percy Shelley, William Blake, the Romantics, but not Byron so much. Christopher Smart and George Herbert, who wrote “The Collar.” Unfortunately not so many women poets. Elizabeth Bishop, Lucille Clifton, Denise Levertov, yes. Adrienne Rich, sometimes. BOOKS: Is there a book that you recommend to your students? OLIVER: No, but I used to have an exercise: I’d say, “Find a poem by a poet you love, read it every morning for a month.’’ Pretty soon they’d have it memorized. I wouldn’t tell them that was what they were doing. People would come in spouting page after page of T.S. Eliot. BOOKS: What kind of novels do you like? OLIVER: Something like George Eliot’s “Middlemarch” or “The Mill on the Floss.” I like books that are fat and full. I’ve begun reading Orhan Pamuk. I just read “Snow,” which is an amazing book. BOOKS: Do you read about the natural world, which you write so much about? OLIVER: I have trouble with some books because I’m so much in agreement with them I’d rather just sit in the grass myself. I like “The Snow Leopard’’ by Peter Matthiessen and “The Song of Dodo” by David Quammen about the extinction of species. It should alarm everyone but it is wonderfully accessible. BOOKS: Did Provincetown affect you as a reader? OLIVER: In a way because my partner had a photography gallery. It was the 1960s. Everyone came to look, but no one bought even though she had Ansel Adams prints for $35. So she began selling books as well. I learned about a lot of writers I didn’t know from the books she ordered, such as Paul Bowles. BOOKS: Did anyone influence you as a reader? OLIVER: Whitman. He’s the one I bummed around in the woods with or so it seemed. I grew up in a sad, depressed place. I got out. Poetry saved my life. BOOKS: How did you discover it? OLIVER: By myself. I would go into Cleveland to a used bookstore. They were very nice to me. I’d go down in the basement with a dust cloth and come up with these treasures. I’d go home with another load of books. The only record I broke in high school was for truancy. I’d put some books in a knapsack and go to the woods. And I got away with it.